Please refer to our stock # uc1 when inquiring. This beautiful vintage bangle bracelet is 5/8" and has a 7" interior measurement. 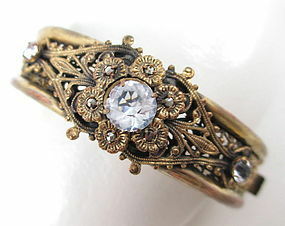 It is made from gilt brass and has an intricate filigree design. The front has a raised floral design with 3 unfoiled crystal accents. It has some minor wear to the gold plating, but it does not take away from the beauty of the piece. Overall, it is in very good vintage condition.